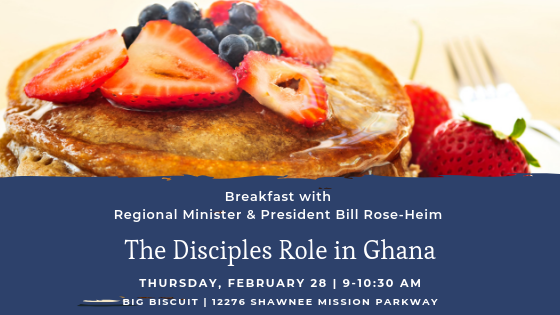 All are invited on Thursday, February 28 to hear Bill Rose-Heim speak about global ministries of the Kansas City region and specifically about the Disciples role in Ghana. We will meet from 9-10:30 am over breakfast at the Big Biscuit in Shawnee (12276 Shawnee Mission Parkway). Bill Rose-Heim is the Regional Minister and President of the Christian Church (Disciples of Christ) of Greater Kansas City. Bill traveled to Ghana last year and will share insight about the mission and goals of the church and its involvement in that region.